Browsing articles tagged with " steel barns and buildings"
When you need an extra building on your farm or ranch it can take a lot to get it going. That is why you can get your next set of steel barn buildings from Coast to Coast Carports. 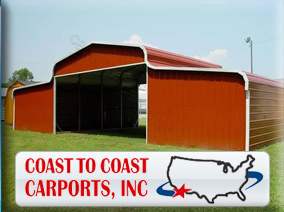 Coast to Coast has the best steel buildings available and they come with the best warranty in the business. All of the steel barn buildings from Coast to Coast come with a 20 year warranty on rust through of framing on roofing material assuming normal user care and maintenance and is made with the highest quality 12, 14 and higher gauge steel. This warranty gives you the assurance that your new buildings will last for years, whereas with other inferior materials you may have to replace your building every few years. Not only can you get the best in steel barn buildings from Coast to Coast, you can get anything else that might need a metal building to protect it. From carports to garages and even storage sheds to vertical buildings and 100 foot wide clear span buildings to protect even the biggest trucks, trailers, or tractors. You can even customize your buildings to hold whatever you need, from boats to motorcycles and anything else. Your customizable options are only limited by your imagination. Your next steel building needs to be durable as well as a good addition to your home or farm. Coast to Coast Carports has the best buildings and with locations around the country there is a great place to find your next steel building. Because freight costs will vary from place to place you need to call Coast to Coast to get more information and find out more about your new steel building barn.